Views and news about geoscience and technology. Closing the gap: what next? I wrote recently about closing the gap between data science and the subsurface domain, naming some strategies that I think will speed up this process of digitalization. But even after the gap has closed in your organization, you’re really just getting started. It’s not enough to have contact between the two worlds, you need most of your actvity to be there. This means moving it from wherever it is now. This means time, and effort, and mistakes. Hardly any organizations have got to this point yet. And I certainly don’t know what it looks like when we get there as a discipline. But nonetheless I think I’m starting to see what’s going to be required to continue to build into the gap. Soon, we’re going to need to think about these things. We’re bad at hiring; we need to be awesome at it*. We need to stop listening to the pop psychology peddled by HR departments (Myers-Briggs, lol) and get serious about hiring brilliant scientific and technical talent. It’s going to take some work because a lot of brilliant scientists and technical talent aren’t that interested in subsurface. You need to get used to the idea that digital scientists can do amazing things quickly. These are not your corporate timelines. There are no weekly meetings. Protoyping a digital technology, or proving a concept, takes days. Give me a team of 3 people and I can give you a prototype this time next week. You don’t have to do everything yourself. In fact, you don’t want to, because that would be horribly slow. For example, if you have a hard problem at hand, Kaggle can get 3000 teams of fantastically bright people to look at it for you. Next week. We need faster research. We need to stop asking people for static, finished work — that they can only present with PowerPoint — months ahead of a conference… then present it as if it’s bleeding edge. And do you know how long it takes to get a paper into GEOPHYSICS? You need Slack and Stack Overflow in your business. These two tools have revolutionized how technical people communicate and help each other. If you have a large organization, then your digital scientists need to talk to each other. A lot. Skype and Yammer won’t do. Check out the Software Underground if you want to see how great Slack is. List 3 new places you could look for amazing, hireable scientists to start conversations with. Find out who’s responsible for technical communities of practice and ask them about Slack and SO. 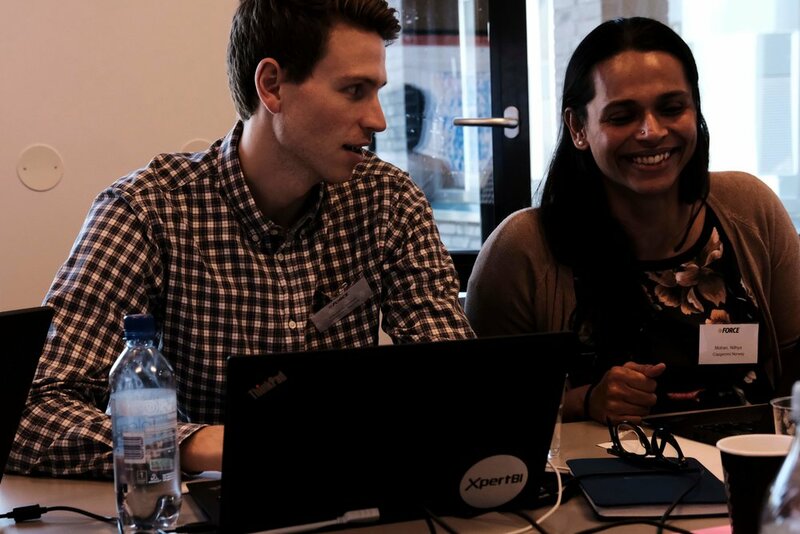 Find 3 people who’d like to help organize a hackathon for your department before the summer holidays. Do some research about what it takes to organize a Kaggle-style contest. Get with a colleague and list 3 datasets you could potentially de-locate and release publically. 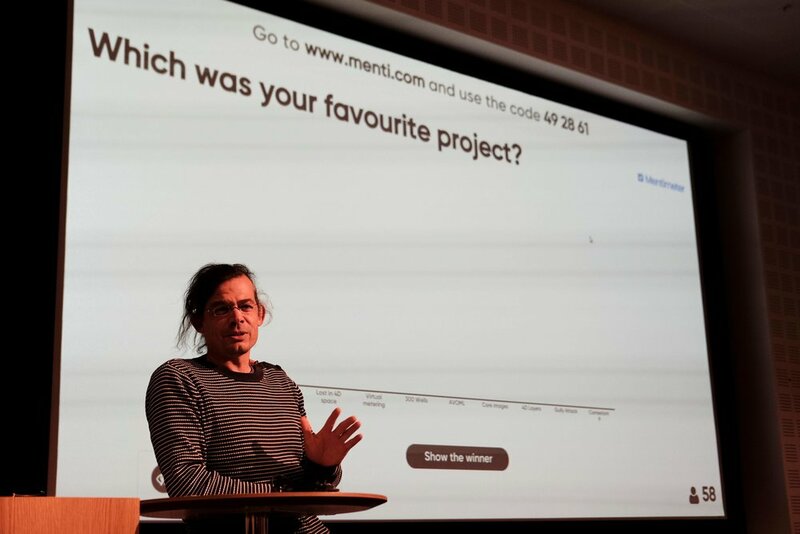 Challenge the committe to let you present in a new way at your next technical conference. I guarantee that if you pick up one of these ideas and run with it for a bit, it’ll lead somewhere fun and interesting. And if you need help at some point, or just want to talk about it, you know where to find us! * I’m not being flippant here. Next time you’re at a conference, go and talk to the grad students, all sweaty in their suits, getting fake interviews from recruiters. Look at their CVs and resumes. Visit the recruitment room. Go and look at LinkedIn. The whole thing is totally depressing. We’ve trained them to present the wrong versions of themselves. Matt is a geoscientist in Nova Scotia, Canada. Founder of Agile Scientific, co-founder of The HUB South Shore. Matt is into geology, geophysics, and machine learning. I recently figured out where Agile lives. Or at least where we strive to live. We live on the isthmus — the thin sliver of land — between the world of data science and the domain of the subsurface. We’re not alone. A growing number of others live there with us. There’s an encampment; I wrote about it earlier this week. Backman’s Island, one of my favourite kayaking destinations, is a passable metaphor for the relationship between machine learning and our scientific domain. In some organizations, there is barely a connection. Maybe a few rocks at low tide, so you can hop from one to the other. But when we look more closely we find that the mysterious and/or glamorous data science team, and the stories that come out of it, seem distinctly at odds with the daily reality of the subsurface professionals. The VP talks about a data-driven business, deep learning, and 98% accuracy (whatever that means), while the geoscientists and engineers battle with raster logs, giant spreadsheets, and trying to get their data from Petrel into ArcGIS (or, help us all, PowerPoint) so they can just get on with their day. We’re not going to learn anything from those organizations, except maybe marketing skills. We can learn, however, from the handful of organizations, or parts of them, that are serious about not only closing the gap, but building new paths, and infrastructure, and new communities out there in the middle. If you’re in a big company, they almost certainly exist somewhere in the building — probably keeping their heads down because they are so productive and don’t want anyone messing with what they’ve achieved. Treating software like knowledge sharing. Code is, hands down, the best way to share knowledge: it’s unambiguous, tested (we hope anyway), and — above all — you can actually use it. Best practice documents are I’m afraid, not worth the paper they would be printed on if anyone even knew how to find them. Learning to code. OK, I’m biased because we train people… but it seriously works. When you have 300 geoscientists in your organization that embrace computational thinking, that can write a function in Python, that know what a support vector machine is for — that changes things. It changes every conversation. Providing infrastructure for digital science. Once you have people with skills, you need people with powers. The power to install software, instantiate a virtual machine, or recruit a coder. You need people with tools, like version control, continuous integration, and communities of practice. Realizing that they need to look in new places. Those much-hyped conversations everyone is having with Google or Amazon are, admittedly, pretty cool to see in the extractive industries (though if you really want to live on the cutting edge of geospatial analytics, you should probably be talking to Uber). You will find more hope and joy in Kaggle, Stack Overflow, and any given hackathon than you will in any of the places you’ve been looking for ‘innovation’ for the last 20 years. This machine learning bandwagon we’re on is not about being cool, or giving keynotes, or saying ‘deep learning’ and ‘we’re working with Google’ all the time. It’s about equipping subsurface professionals to make better and safer scientific, industrial, and business decisions with more evidence and more certainty. And that means getting serious about closing that gap. * If you don’t know what Marmite is, it’s not too late to catch up. In 2015 and 2016 we launched a new web app, Pick This (returning soon! ), and grew our bruges and welly open source Python projects. We also started building more machine learning projects, and getting really good at it. We have spent the recent years growing and honing these projects. The blog gets about 10,000 readers a month. The sixth 52 Things book is on its way. We held two public unsessions this year. 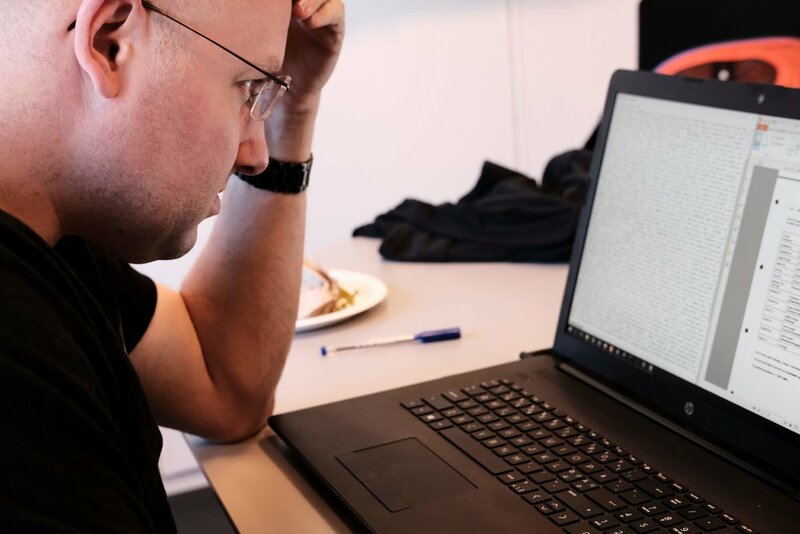 The hackathons have now grown to 60 or so hackers, and have had about 400 participants in total, and five of them this year already (plus three to come!). We have also taught Python to 400 geoscientists, including 250 this year alone. And the Software Underground has over 1000 members. In short, geoscience has gone digital, and we at Agile are grateful and excited to be part of it. At no point in my career have I been more optimistic and energized than I am right now. So it’s time for the next thing. The next thing is starting with a new kind of event. The first one is 5 to 11 May 2019, and it’s happening in France. I’ll tell you all about it tomorrow. At our first machine-learning-themed hackathon, in New Orleans in 2015, we had fifteen hackers. TImes were hard in the industry. Few were willing or able to compe out and play. Well, it’s now clear that times have changed! After two epic ML hacks last year (in Paris and Houston), at which we hosted about 115 scientists, it’s clear this year is continuing the trend. Indeed, by the end of 2018 we expect to have welcomed at least 240 more digital scientists to hackathons in the US and Europe. Conclusion: something remarkable is happening in our field. 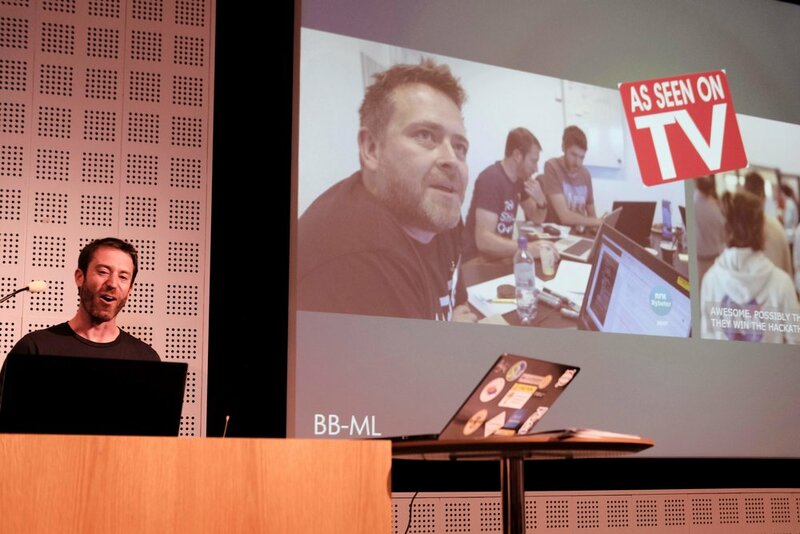 Last Tuesday and Wednesday, Agile co-organized the FORCE Machine Learning Hackathon in Stavanger, Norway. FORCE is a cross-industry geoscience organization, coordinating meetings and research in subsurface. 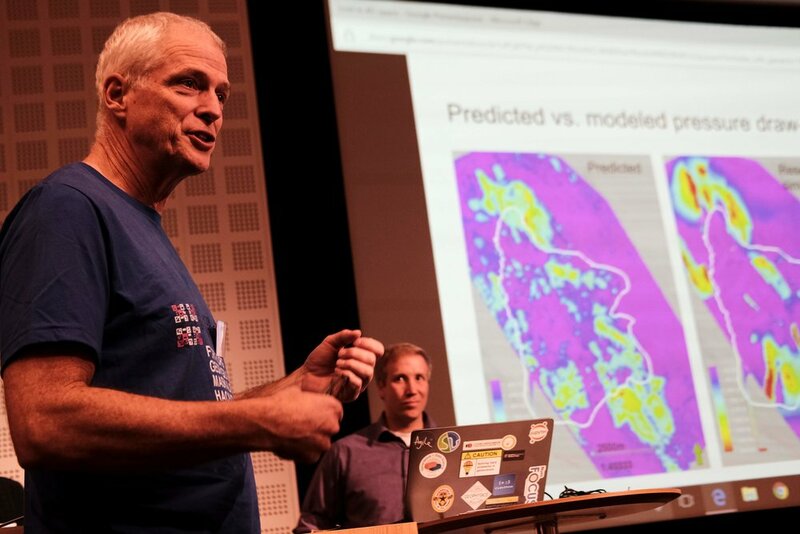 The event preceeded a 1-day symposium on the same theme: machine learning in geoscience. And it was spectacular. 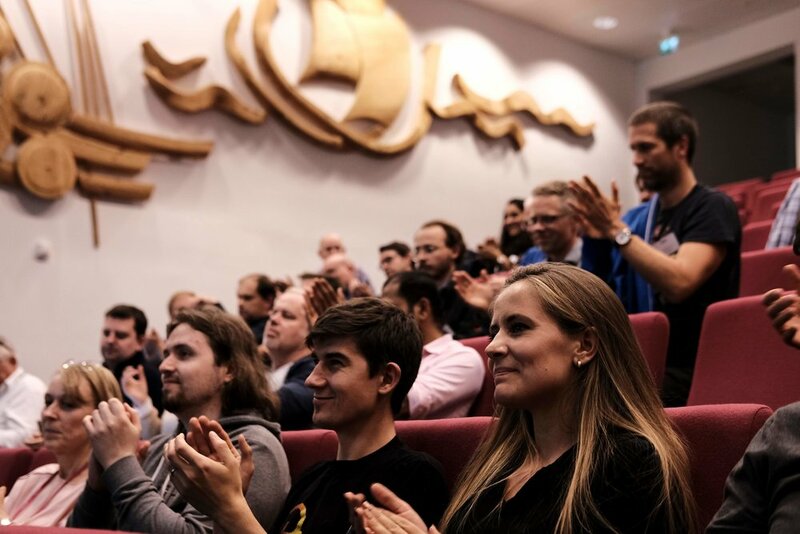 Fifty geoscientists and engineers spent two days at the Norwegian Petroleum Directorate (NPD) in Stavanger. Our hosts were welcoming, accommodating, and generous with the waffles. As usual, we gently nudged the participants into teams, and encouraged them to define projects and find data to work on. It always amazes me how smoothly this potentially daunting task goes; I think this says something about the purposefulness and resourcefulness of our community. Biostrat! Geological ages from species counts. Lost in 4D Space. Pressure drawdown prediction. Virtual Metering. Predicting wellhead pressure in real time. 300 Wells. Extracting shows and uncertainty from well reports. AVO ML. Unsupervised machine learning for more geological AVO. Core Images. Grain size and lithology from core photos. 4D Layers. Classification engine for 4D seismic data. Gully Attack. Strat trap picking with deep reinforcement learning. sketch2seis. Turning geological cartoons into seismic with pix2pix. I will do a complete review of the projects in the coming few days, but notice the diversity here. Five of the projects straddle geological topics, and five are geophysical. Two or three involve petroleum engineering issues, while two or three move into sed/strat. We saw natural language processing. We saw random forests. We saw GANs, VAEs, and deep reinforcement learning. In terms of input data, we saw core photos, PDF reports, synthetic seismograms, real-time production data, and hastily assembled label sets. In short — we saw everything. 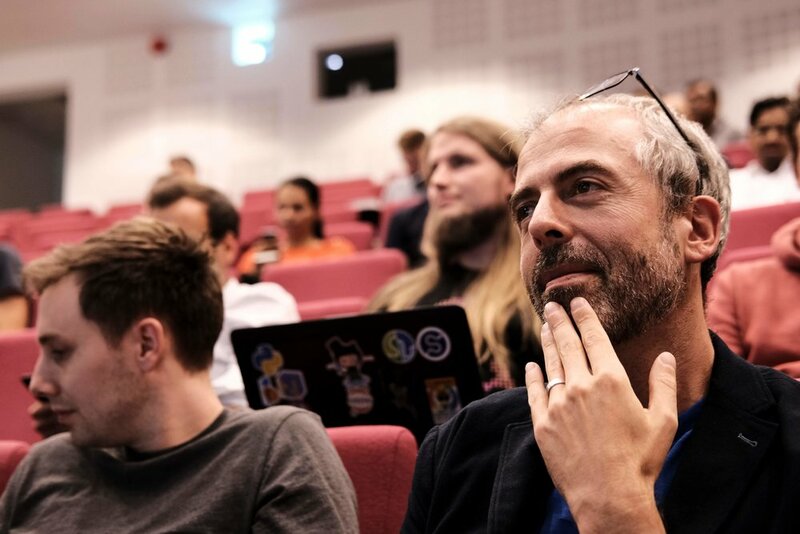 Peter Bormann, the mastermind behind the symposium, was instrumental in making the hackathon happen. Grete Block Vargle (AkerBP) and Pernille Hammernes (Equinor) kept everyone organized and inspired. Tone Helene Mydland (NPD) and Soelvi Amundrud (NPD) made sure everything was logistically honed. Eva Halland (NPD) supported the event throughout and helped with the judging. Alessandro Amato del Monte (Eni) took some fantastic photos — as seen in this post. Diego Castaneda and Rob Leckenby helped me on the Agile side of things, and helped several teams. Aberdeen, 16 to 18 November, at RGU — sign up on Eventbrite. London, 23 to 25 November at Olympia (right before PETEX) — sign up on Eventbrite. Don’t miss out! Get signed up and we’ll see you there. I've been hearing a lot about 'digitalization', or 'digital transformation', recently. What is this buzzword? The general idea seems to be: exploit lots and lots of data (which we already have), with analytics and machine learning probably, to do a better job finding and producing fuel and energy safely and responsibly. At the centre of it all is usually data. Lots of data, usually in a lake. And this is where it all goes wrong. Digitalization is not about data. And it's not about technology either. Or cloud. Or IoT. Interest in the terms "digital transformation" and "digitalization" since 2004, according to Google Trends. The data reveal a slight preference for the term "digitalization" in central and northern Europe. Google Ngram Viewer indicates that the term "digitalization" has been around for over 100 years, but it is also a medical term connected with the therapeutic use of digitalis. Just to be clear, that's not what we're talking about. Oh no, here I go with the hand-wavy, apple-pie "people not process" nonsense... well, yes. I'm convinced that it's humans we're transforming, not data or technology. Or clouds. Or Things. I think it's worth spelling out, because I think most corporations have not grasped the human aspect yet. And I don't think it's unreasonable to say that petroleum has a track record of not putting people at the centre of its activities, so I worry that this will happen again. This would be bad, because it might mean that digitalization not only fails to get traction — which would be bad enough because this revolution is long overdue — but also that it causes unintended problems. Without people, digital transformation is just another top-down 'push' effort, with too much emphasis on supply. I think it's smarter to create demand, or 'pull', so that professionals are asking for support, and tools, and databases, and are engaged in how those things are created. Put technical professionals at the heart of the revolution, and the rest will follow. The inverse is not true. Make it easy for digitally curious people to dip a toe in. Build a beginner-friendly computing environment, and encourage people to use it. Challenge your IT people to support a culture of experimentation and creativity. Give those curious professionals access to professional development channels, whether it's our courses, other courses, online channels like Lynda.com or Coursera, or whatever. Build a community of practice for 'scientific computing'. Whether it's a Yammer group or something more formal, be sure to encourage frequent face-to-face meetups, and perhaps an intranet portal. Start to connect subsurface professionals with software engineers, especially web programmers and data scientists, elsewhere in the organization. I think the best way is to embed programmers into technical teams. Encourage participation in external channels like conferences and publications, data science contests, hackathons, open source projects, and so on. I guarantee you'll see a step change in skills and enthusiasm. The bottom line is that we're looking for a profound culutral change. It will be slow. More than that, it needs to be slow. It might only take a year or two to get traction for an idea like "digital first". But deeper concepts, like "machine readable microservices" or "data-driven decisions" or "reproducible workflows", must take longer because you can't build that high without a solid foundation. Successfully applying specific technologies like deep learning, augmented reality, or blockchain, will certainly require a high level of technology literacy, and will take years to get right. What's going on with scientific computing in your organization? Are you 'digitally curious'? Do you feel well-supported? Do you know others in your organization like you? The circuit board image in the thumbnail for this post is by Carl Drougge, licensed CC-BY-SA. Scientific computing for the subsurface, anywhere in the world. What makes a good benchmark dataset?